Mount-It! MI-847 contemporary TV mount and media component stand combo features a beautiful black silk tempered glass shelf with space for all of your surround sound system components, Blu-ray player, game consoles, cable box and place other media components. The built-in TV mount is VESA compatible and fits TVs up to 55 inches in screen size. Wall mounted TVs look great but offer no storage for audio-video components, whereas classic entertainment centers do not allow the TVs to be installed high up over the shelves. MI-847 offers best of these two options by providing expansive shelf space and elevating your TV with its built-in TV mounting bracket. * TV Compatibility Check: Bolt holes behind the TV should be less than 16.5 inches wide and 16.5 inches high. 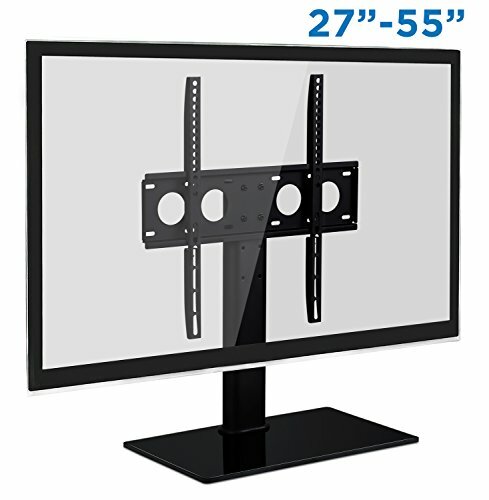 HEIGHT ADJUSTABLE - TV bracket is height adjustable! 3 positions to suit different applications or TV sizes. SAFE AND STABLE - The glass base is 16.6" wide x 10.125" deep for a stable stand and can carry up to 88 lbs. Safety strap ensures the TV and the stand are secured to a wall or the stand/dresser. UNIVERSAL FIT - TV mounting bracket is compatible with Samsung, Sony, LG, Sharp, Insignia, Vizio, Haier, Toshiba, Sharp, Element, TCL, Westinghouse 27, 29, 30, 32, 36, 37, 39, 40, 42, 47, 48, 49, 50, 55 and some up to 60 inch TVs. Please ensure your TV has VESA 400x400 pattern or smaller.